Experience: Meet DJ. 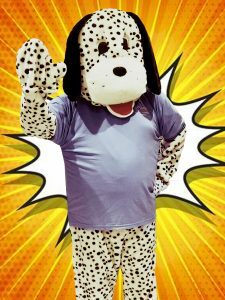 He is a spotty dog that is available to meet and greet at your childs party. He doesn’t talk, which some would say because he is shy, however when attends a good party his lively character shines through. Qualifications: He is DBS checked to work with children and should he attend an event near you, he loves a good selfie and would love to see your photo if you use the hashtag #DJdogselfie and #ACKnell on Social Media.